This Review will include the reviewers But (that is I’ll say some reasonably nice things and then part way through I’ll say BUT and then criticise the film). I’ll also start some sentences with And. The Man from UNCLE opens strong with a nice sequence set in Berlin – a bit Funeral in Berlin. It then strings together a series of well executed scenes mixing thriller and action to a climax. And then it tacks on a second climax. And then it tacks on a foundation story for UNCLE suggesting that this would be the foundation of a new film series. There is a certain amount of 60s chic. Action sequences maintain their visual logic. The sound track is suitably jazzed up. It’s elegantly shot. There are a couple of scene stealing appearances by Hugh Grant who given some time might be able to grow into Leo G Carroll’s role quite nicely. Overall its solid work that pleasantly fills a Saturday afternoon. The Mission Impossible films wear enough of the clothes of the original TV series but not obsessively. It gets the idea that the original has some iconic features like the impersonation face masks and theme tune. While Bond is regularly reinvented but even when the style and face change more elements are kept than the name. Here we get a Kuryakin who has lost his dry sense of humour to become a stereotype soviet agent and his suave to become a body builder. Solo is closer to the mark being well dressed and a womanizer but he’s just too bland. In the original we have the chemistry between Kuryakin and Solo but here it is mostly reduced to calling each other “Cowboy” and “Peril”. Lost are the communicators, the 1960s tech, the door openers, Napoleon’s complicated love life, the theme music, the cut between scenes or most of the originals dressing. I’m not saying that a franchise has to be slavish. The original hardly has the most exciting cinematography and the fiendish death traps have more in common with 60s version of Batman than the exploits of Jason Borne. The final problem is that X-Men First Class by Guy Ritchie’s old collaborator Matthew Vaughn does a better job of looking like The Man from UNCLE (and early Bond) and shows it can be done without ending up in Austin Powers territory. Still at least it’s not yet another parody hung on a classic by people who appear to think the original is just there to make fun of. I enjoyed this review a lot, thanks! 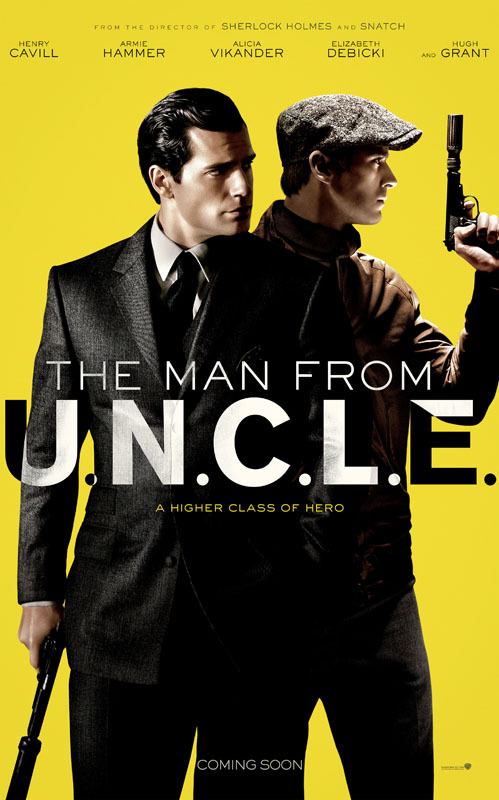 I was a huge fan of The Man from U.N.C.L.E. in its day but have yet to see this picture. Thanks for the assessment - I won't get my hopes up. I generally despise remakes of classics in any genre and therefore am not the least surprised by your huge "but."